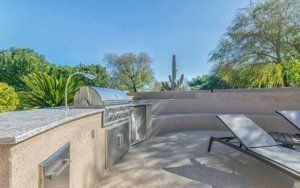 An outdoor kitchen not only expands your current living space, but it also allows you to cook, eat and entertain without having to book a reservation at the latest trendy hot spot. The best outdoor kitchens are as functional as your indoor kitchen, as comfortable as your living room and as entertaining as a family rec room. Obviously your design choices depend on your lifestyle when it comes to designing an outdoor kitchen. They can be as simple as a BBQ, table and chairs, or as elaborate as a fully outfitted kitchen complete with built-in appliances and seating. Developing the floor layout and material of your outdoor kitchen is vital to building the foundation of your space. Factor in the different weather climates that may occur throughout the year, as well as the overall weight of the appliances you plan to install. Flooring – think tile or marble – will be slick and slippery when wet and may not hold up to grease or food stains. Alternatively, if your outdoor space is on a deck, think about re-staining or painting it to match the new renovations and ensure that the deck is in good condition. Also, take into consideration the kind of entertaining you will be doing in your outdoor kitchen. Will there be kids running around? Older guests who need safe, smooth surfaces? Where you decide to place your outdoor kitchen depends upon numerous factors. First and foremost, you’ll want to ensure that smoke from the grill will not drift back into the home. With this said, have a good idea of the general wind pattern in your yard and place the grill appropriately. Next, if you frequently entertain and don’t want to travel far from the indoor kitchen to the outside, think about placing your grill and outdoor kitchen near the entrance to the inside kitchen. Additionally, if you want to maintain the view you currently have from inside the house to the outdoors, be sure to place the outdoor kitchen to the side or at an angle so that the view isn’t completely blocked. Finally, consider the typical traffic flow of your yard for safety purposes. Obviously, a hot, outdoor grill shouldn’t be located right next to the area where a baseball is frequently thrown around, or near where kids are riding bikes or playing. Just like an indoor kitchen, the outdoor kitchen is full of hazards so place it accordingly. Similar to your indoor kitchen, you will need areas to place items on and plenty of storage. The difference is they must all be weatherproof and durable to temperature changes. For a customized look, coordinate your flooring, countertops and cabinets, as you would with your indoor kitchen. One option is to have stone and steel counters and cabinets; this offers a simple, modern look. Keep in mind how much storage you will need for your kitchen. Will you be using this kitchen only in the summer or year round? Many of today’s outdoor kitchens feature a grill, a sink and a small refrigerator. And some kitchens even include appliances, such as a beer tap, smokers and warming drawers. Consider purchasing appliances that will make it through both rain and sun. Appliances made out of stainless steel work great for all weather conditions, are quite durable and require low maintenance. Finally, be sure a licensed electrician installs your electrical connections so you can be assured your outdoor kitchen is up to code. 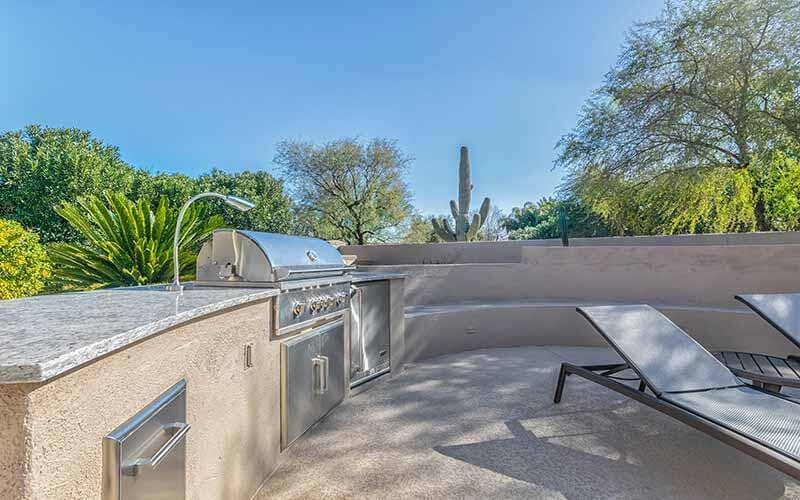 Outdoor living spaces give you the perfect way to enjoy Arizona’s unique environment to the fullest. If your property doesn’t currently provide the outdoor living spaces you would like, Republic West Remodeling can help.